When exploring the world, be open to opportunities, friendly with locals and flexible when plans go awry. Since injuring my back in a cycling accident in 2004, I’ve wheelchaired, crutched and piggybacked all over the world. Here are some of my memorable adventures and the lessons I’ve learned along the way. In 2016, my wife, Britt, learned that her good friend had been selected as captain of the first U.S. women’s rugby team. She would be participating in the Olympics in Rio de Janeiro later that summer, and there was no doubt in our minds that we would go. Britt Kay Murlas and Mickey Murlas Kay in Greece in 2018. The more we thought about the trip, the more excited we got about the possibilities. I really wanted to watch some of my wheelchair basketball teammates in the Paralympics two weeks later, also in Rio. Could we somehow make that work as well? If so, then maybe we could visit our other friends in Argentina between the two events. 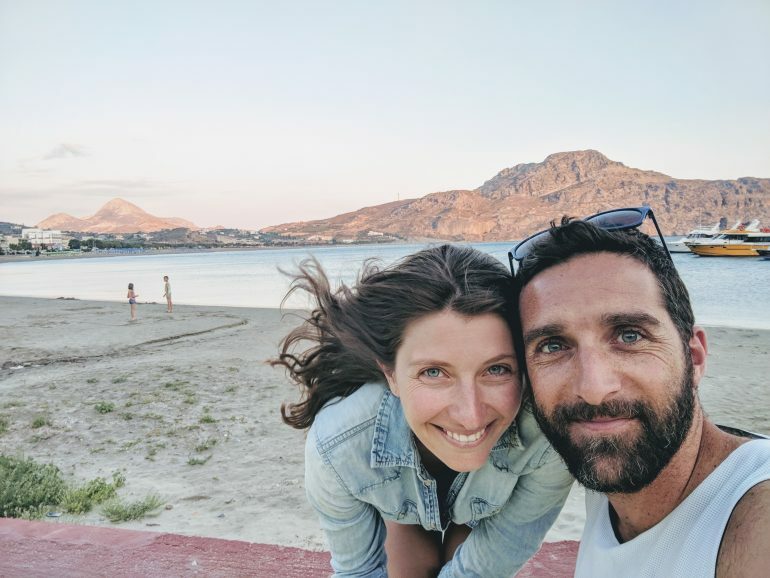 What started as a simple trip to support my wife’s friend turned into an amazing multiweek South American adventure through the urban delights of Rio and Buenos Aires, Argentina, the majestic Iguazu Falls, and too many beautiful Brazilian beaches to count. Not all our ideas came to fruition, but many of them did. And the ideas that seemed most improbable usually ended up being the most satisfying when we pulled them off. Moral of the story: Let your imagination run wild. You’ll have plenty of time to get practical and refine your plan as you go, so begin by brainstorming the biggest and best version of your travel vision. Planning is a great way to set yourself up for travel success, but half the fun comes from the unexpected adventures that you’re sure to encounter. You're sure to stumble upon unforeseen possibilities during your travels, too. When you do, remember: carpe diem! Recently, Britt and I were planning a one-week trip to Europe and feeling lackluster about flying so far for so little vacation time. So, in the spirit of dreaming big, we decided to expand our trip. Of course, this meant a lot more logistics to handle. With our departure rapidly approaching, we divided and conquered. I spoke to my manager about working remotely for two weeks. 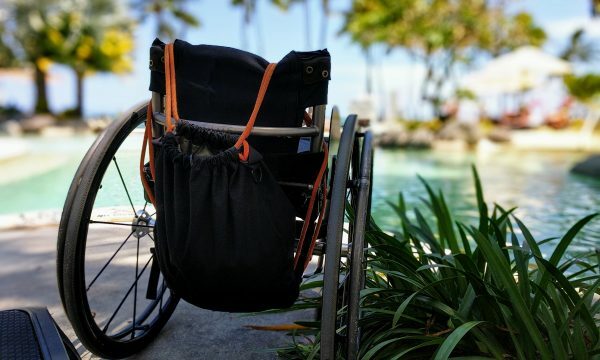 My wife sought out wheelchair-accessible Airbnbs in the new destinations we’d be visiting. We both scrambled to find a sitter for Larry, our curmudgeonly (but adorable) Chihuahua. In the end, our short trip evolved into a one-month journey through Denmark, Hungary, Greece and Spain. It took some doing, but in the end, the work was absolutely worth it to bring our vision to life. When it comes to travel, particularly extended trips, unexpected stuff is going to happen. The more you can roll with the punches and laugh it off, the happier a camper you will be. Many years ago I rode in a “camioneta” (a reclaimed, tricked-out U.S. school bus) to a Guatemalan coffee farm. The driver had casually strapped my wheelchair to the roof and assured me that everything was fine when I uneasily asked him if it was secure. My fears were confirmed when we arrived. One of my chair’s side guards was missing, and I had a flat tire to boot. Mickey Murlas Kay touring a coffee farm in Guatemala in 2009. 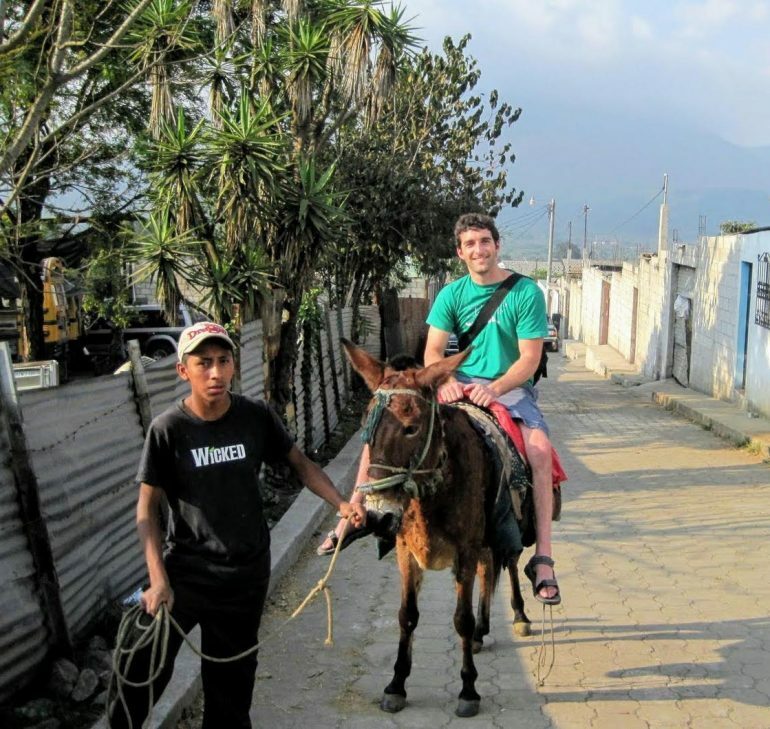 I was ready to admit defeat, but within minutes, the friendly Guatemalan guide wrangled up a donkey for me to ride on the tour of the farm. He also promised that his friends would fix my tire by the time we returned. Up on the donkey, I ended up with the best seat in the house for the tour. And when we returned, sure enough, my tire was as good as new — despite the fact that we were in the middle of the countryside with no bike shop for miles. What’s more, on the ride home, the bus driver suddenly screeched to a halt, ran out of the bus, and returned triumphantly with my missing side guard. He had spotted it lying on the road where it fell from the bus earlier. All’s well that ends well. So when plans go south — and they will at some point — consider how you can roll with the situation. Reflect on the fact that you’re on an amazing trip, and maybe even laugh at the joke that life is playing on you. I’ve found that one of the most satisfying parts of travel has been the people. Beyond being friendly and interesting to talk to, I’ve been amazed countless times by people’s willingness to help me when I’m traveling. Whether it’s helping fix a tire in Guatemala, offering accommodation in a luxury treehouse in Arizona, inviting me to tag along on a once-in-a-lifetime yacht crossing of the Panama Canal, the locals I’ve met have proven to be friendly and generous, time and again. One group of friendly soldiers even piggybacked me up the ancient Israeli fortress of Masada in 110-degree heat! Travel enough, and you will undoubtedly find yourself needing a helping hand, expert guidance or even just some friendly company (especially if you are traveling alone). Don’t hesitate to turn to locals for support, and more often than not you’ll be pleasantly surprised.